Although most people have no problems consuming ginger in its natural form, its pungent taste may be too much for some, especially when it comes to treating health conditions. Fortunately, there are commercial ginger supplements made for oral consumption. The greatest advantage of ginger supplements is that they allow you to control the dosage. All commercial ginger supplements are labeled with the amount of active compounds they contain, which is especially important if you are taking ginger to treat a health condition. It is recommended that adults consume no more than four grams of ginger a day, while a daily dose of one gram should be the limit for pregnant women. Before starting to take ginger root supplements, be sure to consult your doctor concerning the right dosage for you. Besides pure ginger powder, capsules are the purest and arguably the most widely consumed form of this herb. 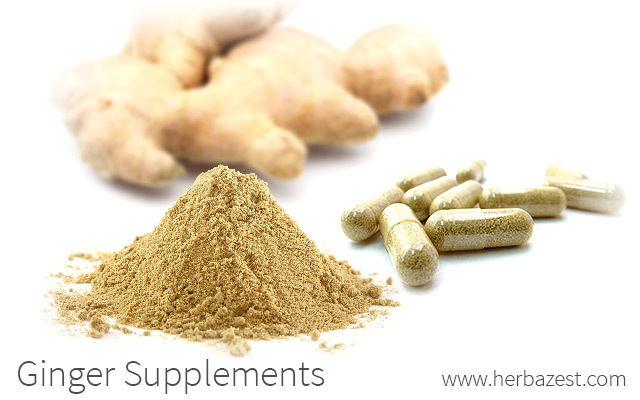 The most common forms of ginger supplements are dried ginger in powder form, ginger root capsules, and ginger tablets or pills. Consuming it in powder may cause belching and mild heartburn; however, these ginger side effects are often avoided by taking it in capsules. However, it is recommended to take them with food in order to avoid upset stomach. Among the many ginger health benefits associated with taking this Asian root in supplemental forms, the most notable one is countering nausea and vomiting. The use of ginger for upset stomach, for providing relief from pregnancy-related nausea and vomiting, as well as for improving motion sickness, has been shown to be more effective than placebo and dimenhydrinate in clinical trials. In the form of supplements, the benefits of ginger for inflammation have proven useful for treating migraine, headache, swelling, and pain. A study published in the journal Arthritis and Rheumatism (2001) established the effectiveness of ginger supplements in reducing the symptoms of osteoarthritis of the knee when taken twice daily. Additionally, current research suggests that ginger may be useful in lowering cholesterol and preventing blood clots, as well as in regulating blood sugar. These benefits make Zingiber officinale a great alternative for the prevention and treatment of heart disease and diabetes. There are many places where you can purchase ginger supplements, including grocery stores, drugstores, natural food stores, stores that specialize in natural health and nutrition, general merchandise retailers, and even online. Ginger can also be found in combination with herbs that offer similar benefits, such as turmeric and artichoke. The prices of ginger supplements vary according to the type, the brand, the weight, and the concentration of active compounds. Some factors that will help you choose the best ginger supplement for you include price, quality, availability, and your reasons for supplementing with ginger. While all forms of ginger supplements will provide health benefits, which one is best for you may depend on your health condition. For example, some physicians recommend taking ginger capsules when it comes to treating arthritis pain and inflammation. Although the medicinal uses of ginger provide many health benefits, its pungent and spicy taste is not everyone's favorite. Additionally, when using it to treat specific conditions, it may be difficult to get the right dose from its raw form. Thus, herbal supplements are a great way to take advantage of ginger properties.